A very special little girl is turning two the day before my birthday. 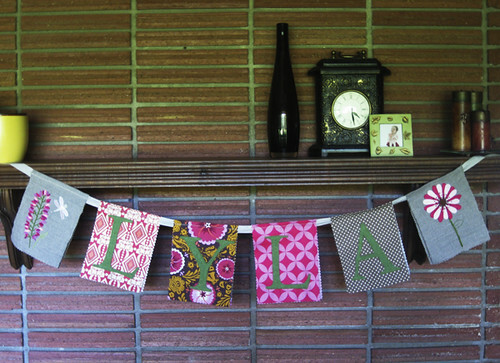 I so enjoyed making this name banner for her bedroom! The letters were cut from an unwanted felted wool sweater and machine appliqued. I wonder if her mother will be able to place that sweater from our high school days. 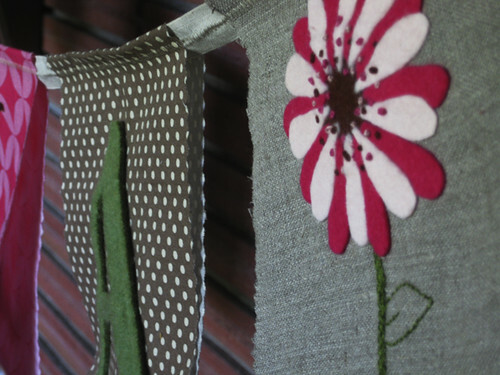 The flowers at each end are adapted from Sandi Henderson’s Sewing Bits and Pieces. Although she used them for sachets, I knew immediately that I wanted to use them for a name banner. 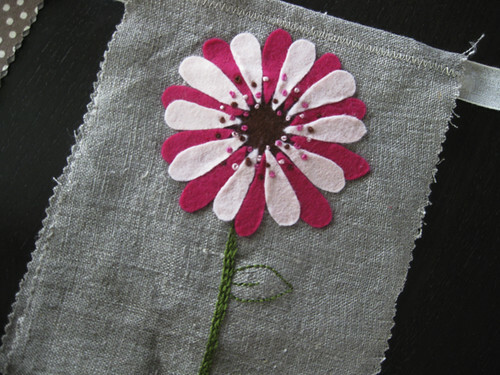 As per Sandi’s directions, the petals are cut from wool felt and fused on the linen. From there the embroidery was pure play. 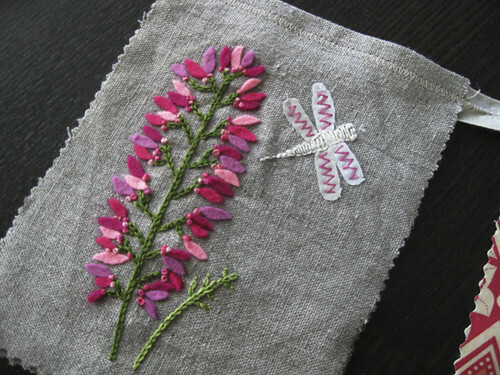 Don’t you love Sandi’s generous use of french knots? And, here’s the other one. I added the little dragonfly since Lyla’s room has a girly bug theme. Happy Birthday, Lyla! A package is on its way to you this week. Today I was sick. While I did finish up two projects, I didn’t get a chance to photograph them. I hope to be back tomorrow with pictures and an exciting announcement. 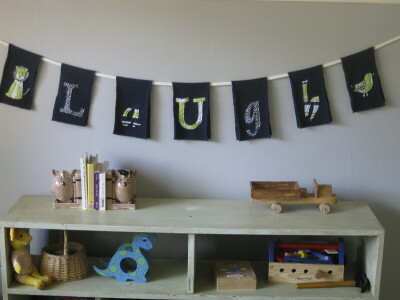 Meanwhile, I’ll share my very first “because I want to” sewing project – Liam’s LaUgh banner. Amanda Soule’s “Handmade Home” was my inspiration. That, and Liam’s woefully empty wall. It’s really a very easy project. I used my husband’s cast-off wool sweater and appliqued the letters leaving exposed raw edges. the hardest part was figuring out how to attach it to the wall. Amanda used a drawer pull, but my husband couldn’t figure that out (least of all me), so we opted for some cool upholstery tacks. The letter materials are from his retired crib set and some fabric I had used to recover our glider. (Sniff, sniff… oh the days of rocking my babies to sleep!) So nice to keep those memories around. I read my then 2-year-old some of the words on Amanda Soule’s idea list and he grabbed onto “laugh”. Perfect for him. The word called for an off-kilter capitalization, don’t you think? 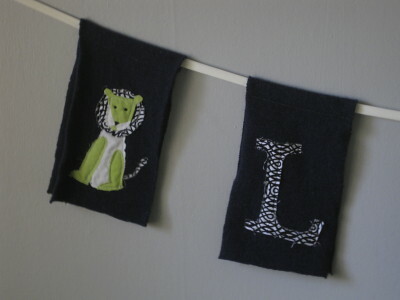 The lion applique was the most fun. Liam loves to pretend to be a lion, or pretend to be a zookeeper tending to a pack of lions. And lately, he’s had imaginary friends too. The boy knows how to pretend! 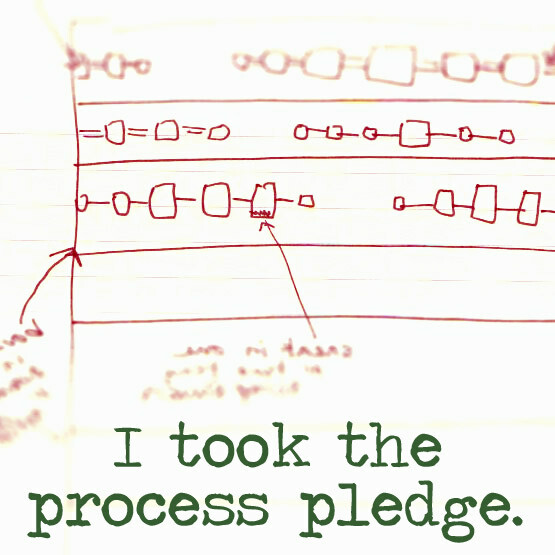 If you’ve done this project before, did you felt the wool backing? SouleMama didn’t say to felt the wool, but now that I’ve seen other projects, I’m wondering if that’s what she intended. Oops! At last, my Colorbrick Quilt is finished. Don’t I look fine curled up with it on the couch? Granted now it’s practically too warm for a throw quilt, but you don’t think I’m going to let that stop me, do you? Nope. You had seen the quilt top Work In Progress before, so I’ll tell you a bit about the finishing details. The back is mostly solid natural linen with a few strips of my favorite Good Folks fabric to liven things up. For batting, I used a thrifted army wool blanket. It’s washable, warm and indestructible. 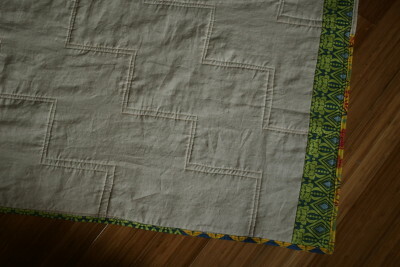 As such, I was able to quilt it loosely, just stitching in the linen “mortar” of the brick-inspired design. The binding gave me the most trouble. I wanted to use a store-bought binding, so I settled with a bright yellow from Hancocks. It was brighter than I wanted, but I went ahead and focused on learning how to machine-apply binding. 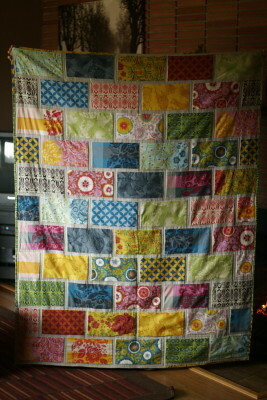 After I sewed the last stitch, I threw the quilt on the floor to get a look and immediately hated the binding. I removed it the next night! Forced to make my own binding, I used some trimmings from the quilt back and it wasn’t as hard as I feared. I’ve used up my stash of linen, so I plan to order more for upcomming projects. 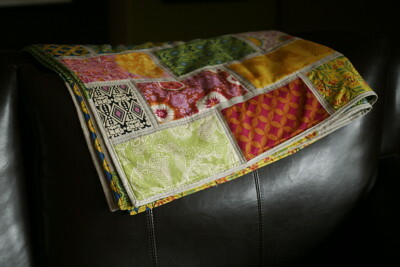 I want to give credit to Rashida Coleman-Hane who blogs at I Heart Linen and recently published I Heart Patchwork. She’s created a fellow linen-lover. I too love how natural linen pairs effortlessly with fun cotton prints. It gives the look an earthy vibe, and tones down my color-loving craziness. I just droooool over I Heart Patchwork. It’s a beautiful book with lots of worthy projects. 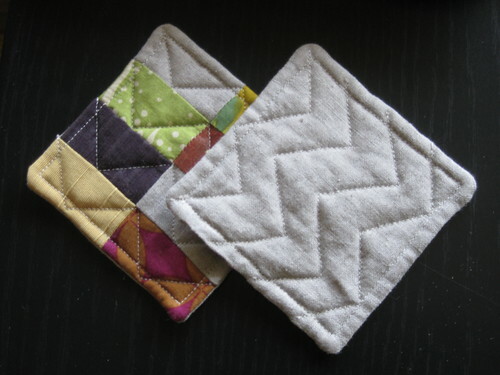 I made a set of Rashida’s Patchwork Coasters awhile back. My friends’ admiration drove us to organize a little sewing group where they are making Patchwork Coasters of their own. 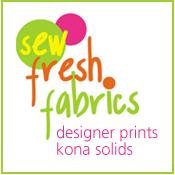 So, double thanks, Rashida, for helping spread the sewing-love among my friends!